A lot of people ask me about materials and techniques that I employ, and I've always really enjoyed it when other artists let me peek in on their process, so let's sweat the details together shall we? First off, even before we get into materials, I think it's important to respect your art and anyone who may want to purchase it. You art is your legacy and if you're lucky it will last longer than you, you bag of decomposing bones. Although I wouldn't classify myself as a "Gear Person" you know the type; has to have the finest this and most expensive that, however, drawing on a used pizza box with a ballpoint pen isn't going to cut it either. It's important to use acid free papers and light-fast inks, your future-self will thank your past-self for doing it. 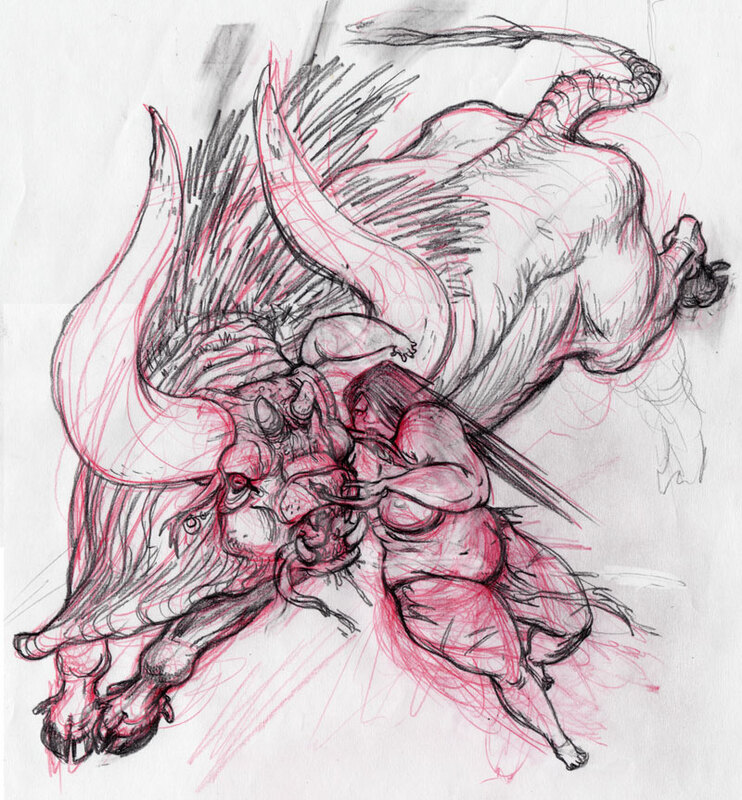 First I draw a rough on animation paper using a red col-erase pencil and a soft graphite pencil (5B). Animation paper is fine-toothed and very thin, made for light boxing. As you can see I get pretty sloppy, and that's the way I like it. I don't ink directly on my rough and I find this gives me the freedom to make mistakes and take chances. If I start inking and don't like how it's turning out *crunch* off it goes in the wastebasket and it doesn't matter because I still have my rough. I always ink the faces first, because if you screw up the face your drawings are done for. Oh, and I hate white-out and rarely use the stuff. The paper I use when inking is from these sketchbooks that I purchase at my local art supply store. It's nothing fancy but it's acid-free and has the perfect medium-tooth for dry brush and it's 73lb, so it's thin enough to light box with. The ink is applied with a #2 Winsor & Newton University Series, they have synthetic bristles so they're inexpensive and durable. The ink I use is Speedball Super Black India Ink, when opening a new bottle I leave it uncapped for about a week to thicken it. I use a post-it note stuck near my art to wipe any excess ink off the brush, very important when applying a dry brush technique. The overall theme to my work area is "Organized Chaos". That's my table-top animation desk that I use to do all my work on (there's a light behind it for light boxing). Non-permanent scotch tape is important to tape up your art so it doesn't fall down all the time. Also the natural-light lightbulbs for your desk are fantastic, they're easy on the eyes and makes your colours so much truer. Thanks everybody for your continual support and now that I've shown you mine let's see yours. MAN I love this drawing,I dragged my boyfriend over to the computer to show him cause I loved it so much haha! It's cool to see your process. I should post mine too! I'm glad you like it! You should post your process too, it's always neat to see. Yeah, clutter just happens when you don't have much space. My husband works on the other side of the table. The art desk that my animation table in on is actually a door on it's side with a smooth surface on it. It's hinged on a couple of 2x4's. WOW! This is incredible, Dart. I can't stop looking at this drawing. It makes me want to draw better. Your workspace is what my workspace aspires to be. Thanks Jordyn! Yer so nice! I LOVE red col-erase. I can't work in non-photo blue, for whatever reason, but scarlet red rocks. Thanks for naming your brush -- I've never tried that one, I'll have to check it out. Funny, I'm the same way too, I just can't rock the blue. It's gotta be red. They're good brushes, I've been very happy with them so far. Lovely work here, man. And your desk is so cool, I want to sit at it! Sure, come on over! I might put you to work though. Hell yeah I love your warrior women! Fabulous pic! 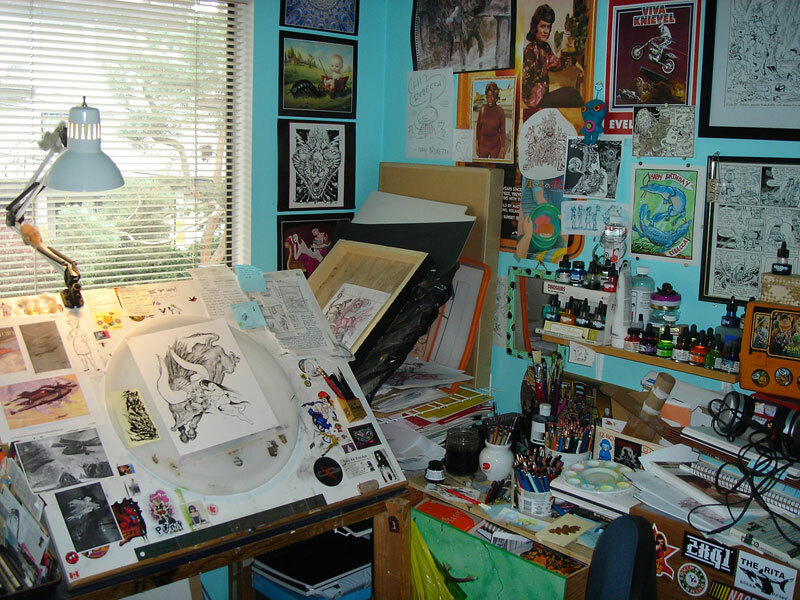 I also love seeing artists' studio spaces, so thanks for sharing! It's such a colorful happy sanctuary of whirling colors and florishing pencils. Thanks so much. Sometimes it seems more like a prison of whirling colours and flourishing pencils. There's nothing more frightening than a blank, white page (sometimes a shot of brandy can help with that though). Drawing for me is usually a fluctuation of anxiety, dread, frustration, extreme egoism and severe self doubt. Sometimes I use white ink for certain effects or for covering mistakes on work that is to be reproduced, but for one-offs, something that could be feasibly hung on a wall, I don't like to use it. I could write pages about art that has been destroyed by cats. And please don't call yourself a talentless hack, it makes me angry. I loved this post! So great! What a wicked drawing! That bull's face is one pissed off dude! Great studio space! I collect a lot of original artwork, whats that on your walls there? I mean what are those originals on your wall? Thank you! I have a bit of tendonitis in my right arm, so I find inking with brushes has helped a lot with that, as you don't have to exert any pressure on the paper as you do with pens. There's so much to love about this drawing! 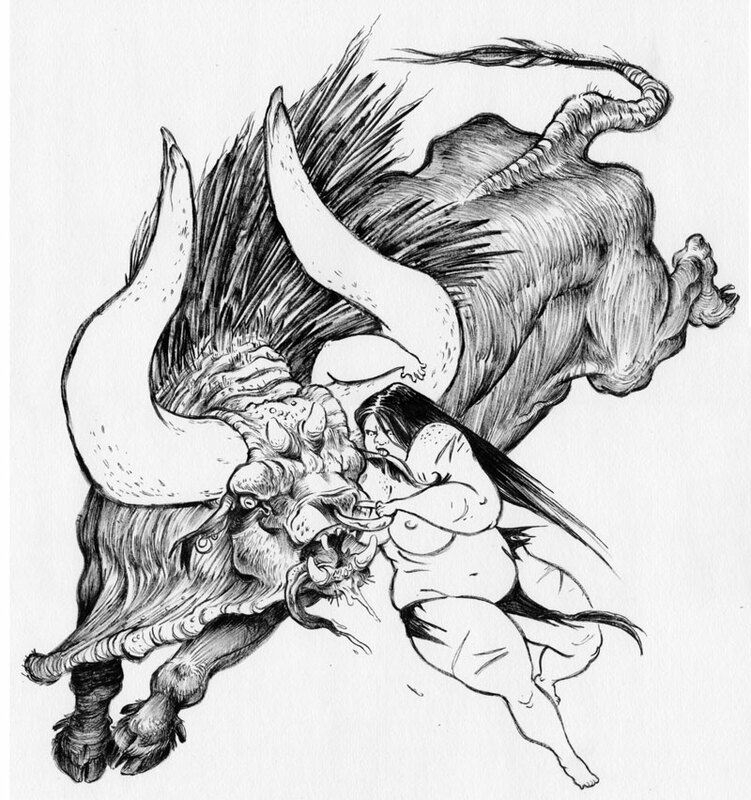 The expressions and the chunky muscles on the bull are my favorite. Thanks for the process post! More chubby warrior!! Great flow. As someone who loves seeing them also, I thank you for the work station and progress sketch. Well, your posts showing your puppet-making process are a real inspiration. Superblack is The Gawd. I've heard arguments for Black Magic, but I can't see the appeal. Superblack is less like putting on black and more like applying Null-and-Void to a surface. It's black. That's a fantastic workspace. I need to get my area at least half as methodical and organized as what you've got. I can see the efficiency in your set up! Ha Ha! I've never tried Black Magic, but your totally right, I haven't found a better ink than Super Black. People always want to come up and see my studio. If mine looked like yours I might let them. My work surface is a drawing board and the half of my $99 Ikea love seat that I'm not sitting on. That is an inspired piece of work you've posted. Lovely! Well, ya know, Chester Brown drew most of his comics on a board while sitting in bed, so wherever there's a will there's a way. thank you so much for posting your process =) it's always great to see how someone works! i'm really impressed with your drybrush technique -- the way you render the textures in your pieces is fantastic. i'd like to try this out for myself one day! and finally, very nice set up! it seems like a place that fosters a creative atmosphere. Thank so much! Drybrush can be more time consuming than regular inking, but I like the soft edges you can get with it and it's surprisingly forgiving.